Maybe it was the weather (cold and rainy) or maybe we were just burned out on cities… but we didn’t really connect with Buenos Aires during our four-week stay. 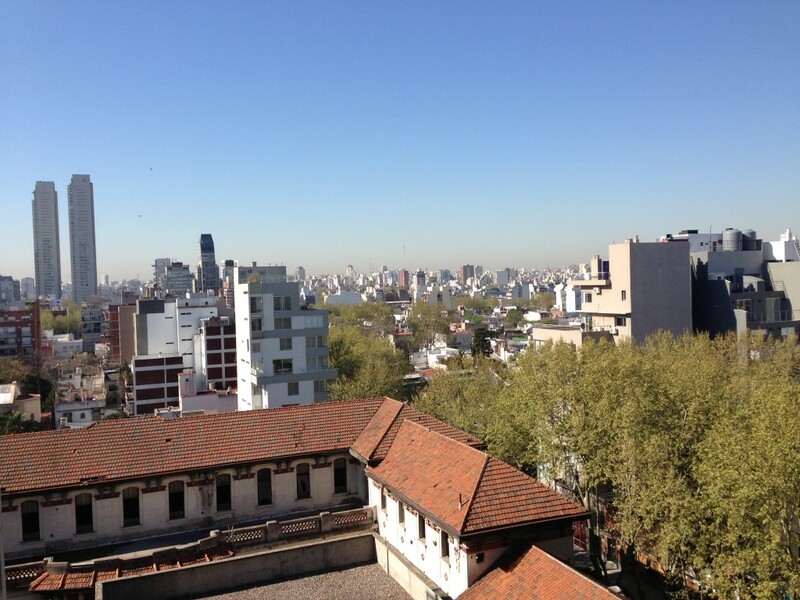 Buenos Aires was the third long-term stay on our trip around the world. 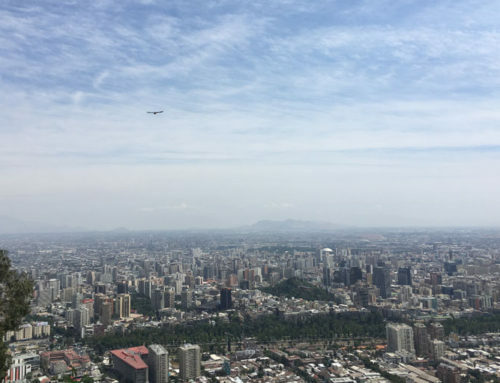 We anticipated the chance to unpack, cook, wash clothes, relax, and get to know the city. The weather was all over the place; some days were warm, others a bit brisk, and many were bitter cold and rainy. Unfortunately we did not have proper clothing for cold, rainy weather, so we were home bodies for roughly half of the time. We did find a few interesting sights and a favorite neighborhood, but we were turned off by a few things like the broken up sidewalks with dog poop landmines in some areas. 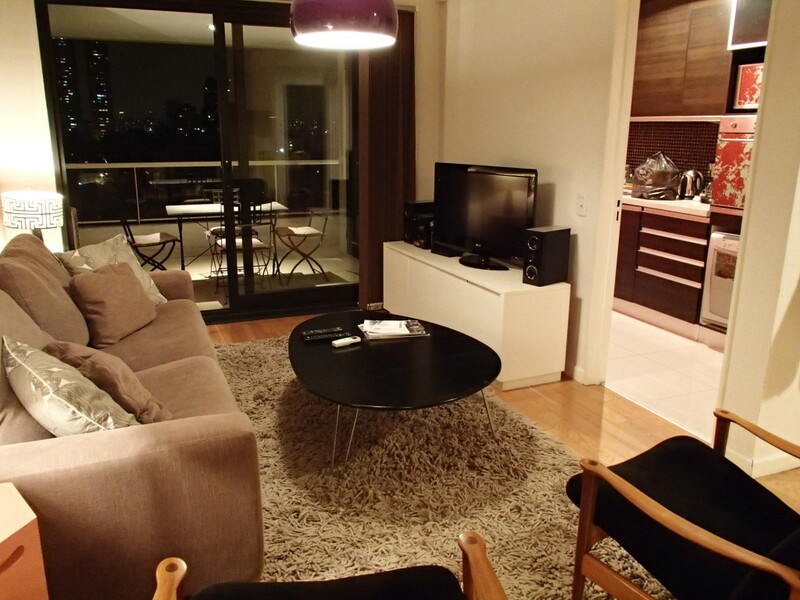 Our flat was awesome, lots of space and a decent gym, so the cold days spent at home were nice. 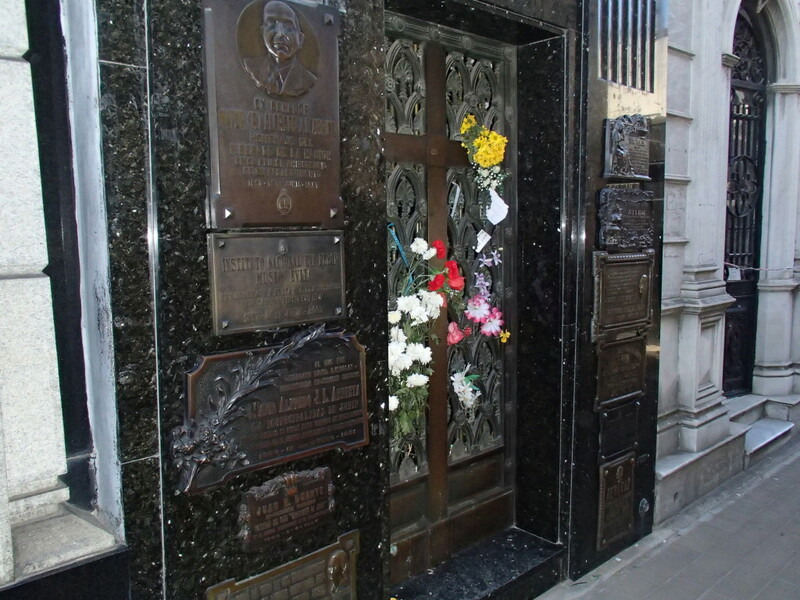 On our first day of sightseeing we went to Recoleta Cemetery – the resting place of many famous and wealthy Argentinians. The cemetery was built in 1820 and has approximately 4870 graves ranging from simple headstone to elaborate mausoleum. At the entrance, a friendly guy with a nametag welcomed us and jotted down points of interest on a flyer – and then he flipped over the flyer and asked for a donation for his children’s charity. We hate it when people pose as attraction staff or tour guides to solicit money! Lori wondered if it was disrespectful to sightsee in a graveyard. As we wandered, it sometimes looked more like a small village than a cemetery. The graves were built in a variety of styles – some simple; some super elaborate. Some were in a state of decay with weeds growing through the floor. We saw the resting places of famous political and military figures, along with regular people. 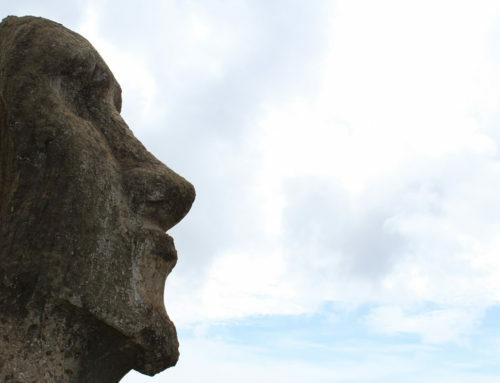 You can explore on your own or take a free guided tour in Spanish or English. 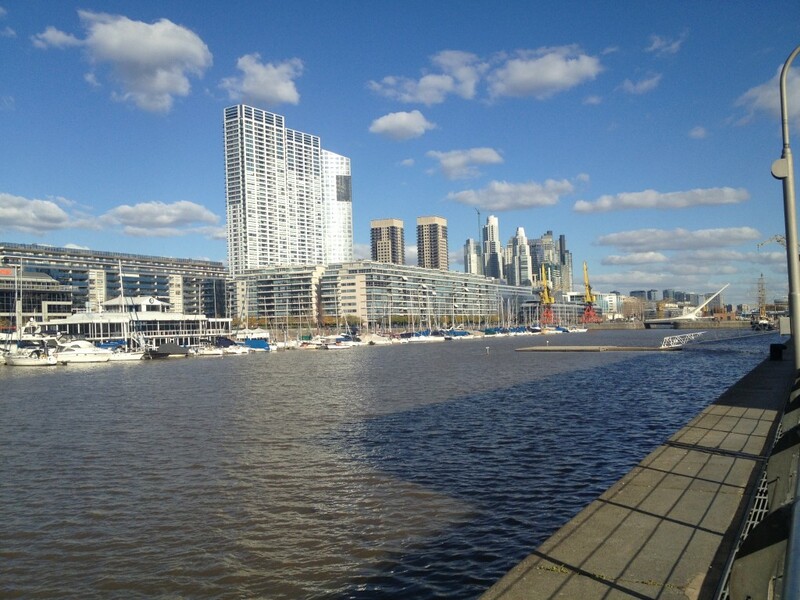 Puerto Madero, the city’s main port on the Rio de la Plata, has a modern vibe. There is a small marina, ferry terminal, along with office and residential towers. 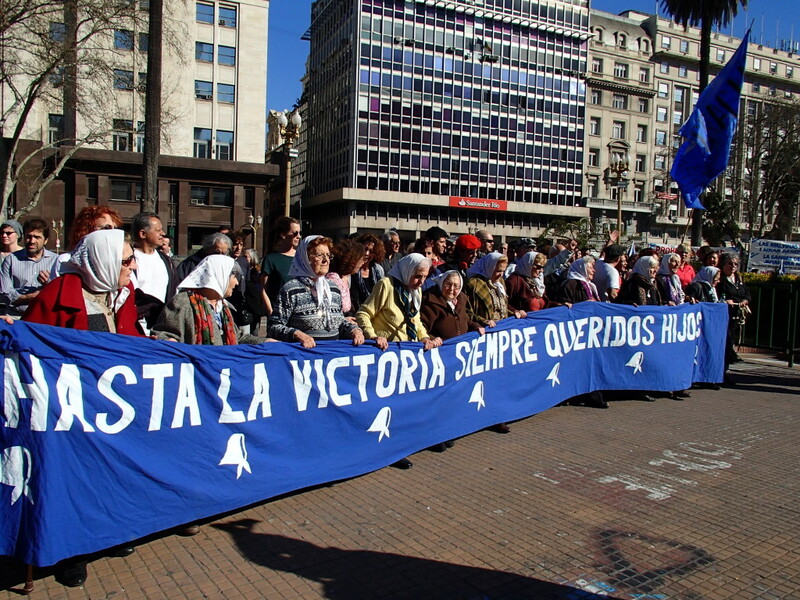 Restaurants and a few shops line the harbor leading to Puente de la Mujer (Women’s Bridge), which honors notable women in Argentina’s history. When we visited, it was very quiet and there was not much going on. Palermo Soho is like a village within a city – it has a lot of character, although it is a bit rough around the edges in some spots. There are no tall buildings – most are only a few stories tall. The streets are cobblestone and the sidewalks are lined with tall trees (since it was winter, all were bare, but we imagine they form a wonderful shade canopy when in bloom). Palermo Soho is bursting with small shops and cafes. On the weekends, there are outdoor craft stalls in a few spots. You could easily spend several days of leisurely browsing or shopping in this cute neighborhood. The National Museum of Decorative Art has a wonderful collection of European and Argentinian paintings, sculpture, and furniture with works by Tolous, Manet, Monet, Gaugan, Renior, Degas, Candido Lopes, and more. Admission is free and information is in English and Spanish. If you like this type of art, the museum is a must see. The Evita Museum has a small collection of photos, video clips, clothing, books, and household items. If you don’t know much about Evita, take some time to read up before you go because all of the information is in Spanish. The museum was ok; if you have limited time during your Buenos Aires visit, this one can be skipped. We tried to visit Museu de Arte Latinoamericano (Malba), but like the Picasso Museum in Barcelona, there was a huge line to get in so we reluctantly decided to pass. We read that Buenos Aires is in some ways like the Paris of South America, so we expected to find picturesque boulevards. There were a few wide streets that were nice for a short stroll, but nothing that came close to the character of some European cities. 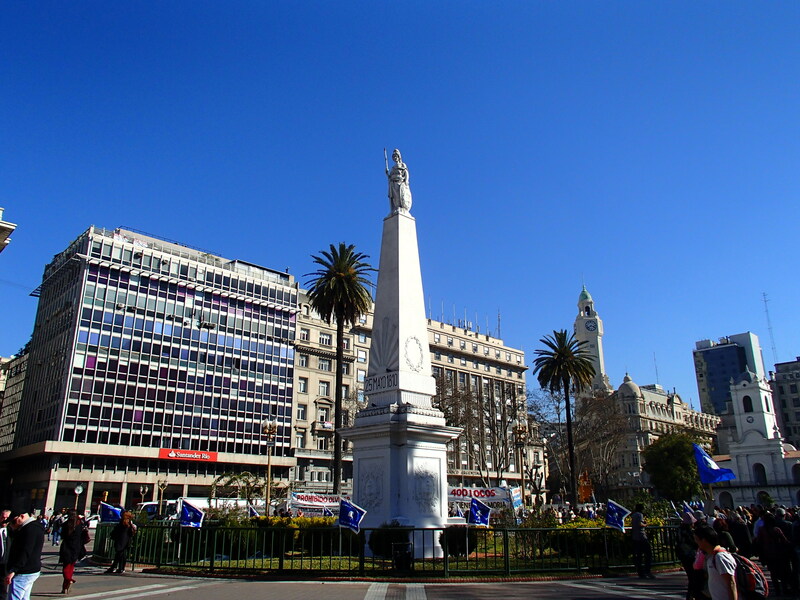 Avenida del Libertador runs through the city and has tall residential and office buildings, museums, parks, and statues. Avenida 9 de Julio is a wide, busy, loud street filled with businesses and a bus station. On the corner of Avenida Corriente, you’ll see a large stone obelisk that was built in 1936 to celebrate the city’s 400th anniversary. The famous Teatro Colon is on nearby Calle Cerrito and is open for tours. Turn down some of the side streets and you will find souvenir shops and guys walking around who are really eager to exchange money for you. 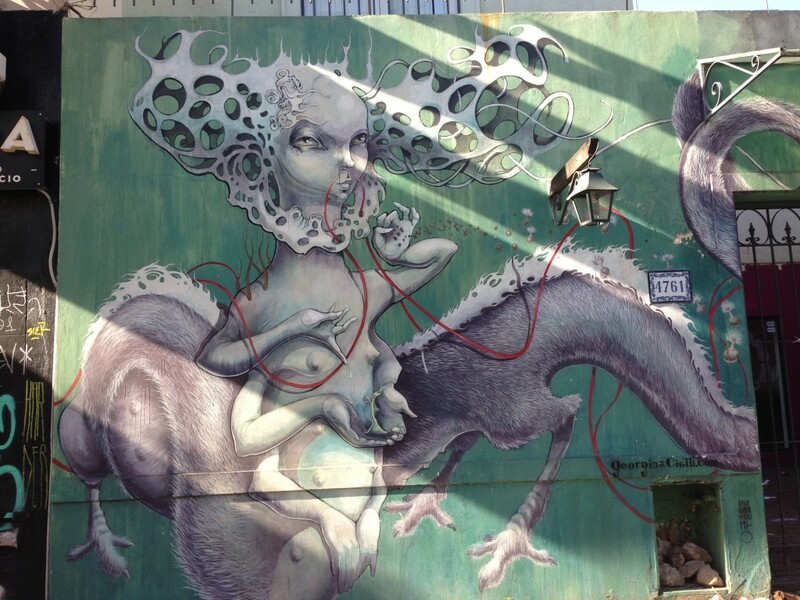 Buenos Aires is a city of street art – you will see paintings and murals on buildings, underpasses, and walls. 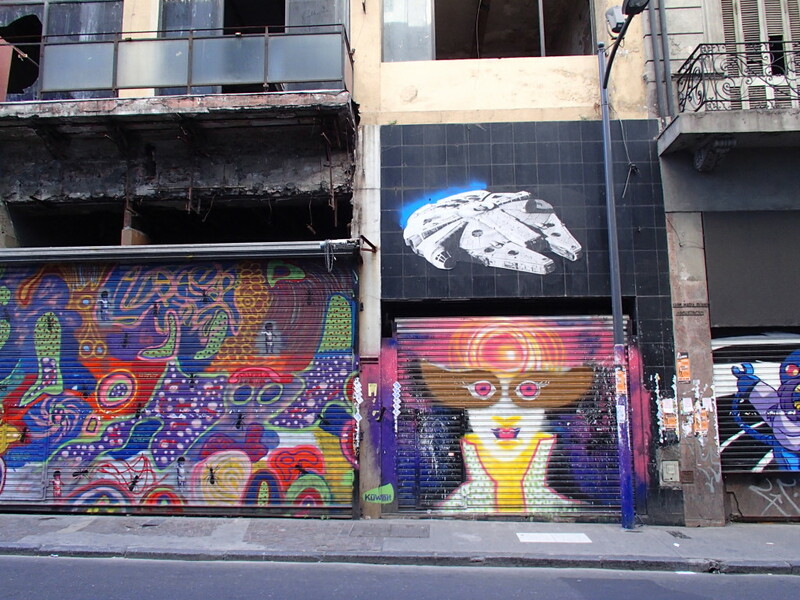 We saw a few interesting works in our neighborhood and planned to take the Graffitimundo tour our final week, but a storm blew in and it was cold and rainy most of the week. 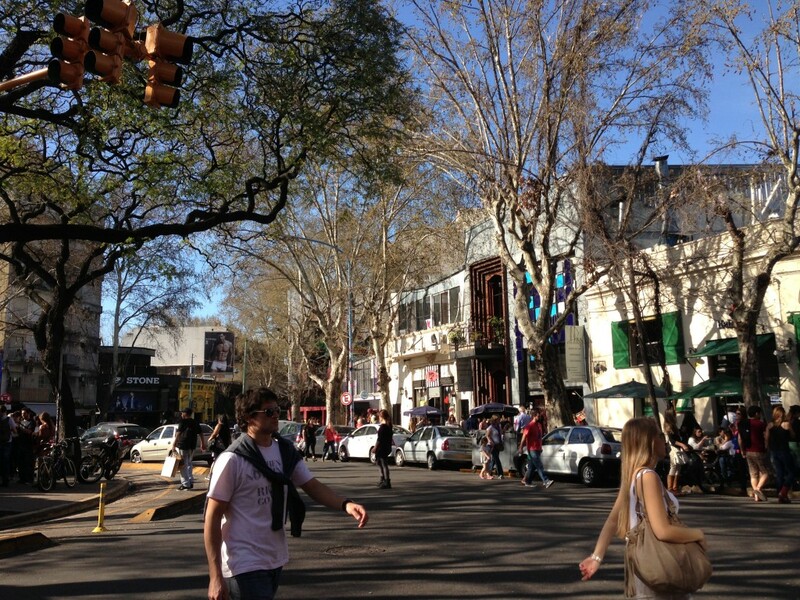 Ladies – if you like shoes, purses, and leather jackets, you will love shopping in Buenos Aires. Some of the clothing was pretty cute too. Shopping in Argentina was similar to shopping in the US in that the sales staff is very available and seems eager to help. One thing that was strange though, you are not allowed to try perfume/cologne on your own – don’t touch the tester bottles – the staff will spritz it on a test strip for you. 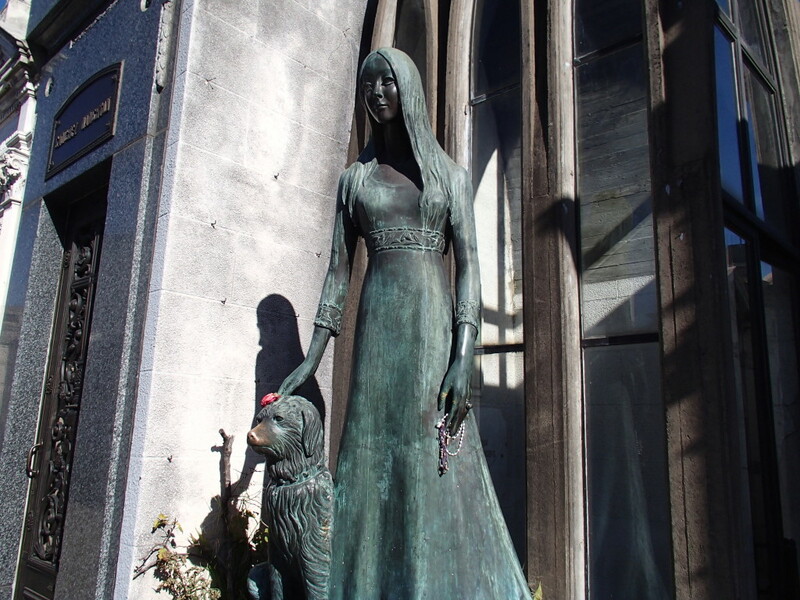 Believe it or not, we only ate out one time – lunch near Recoleta Cemetery, and got take away once. We also tried empanadas from a few different markets. 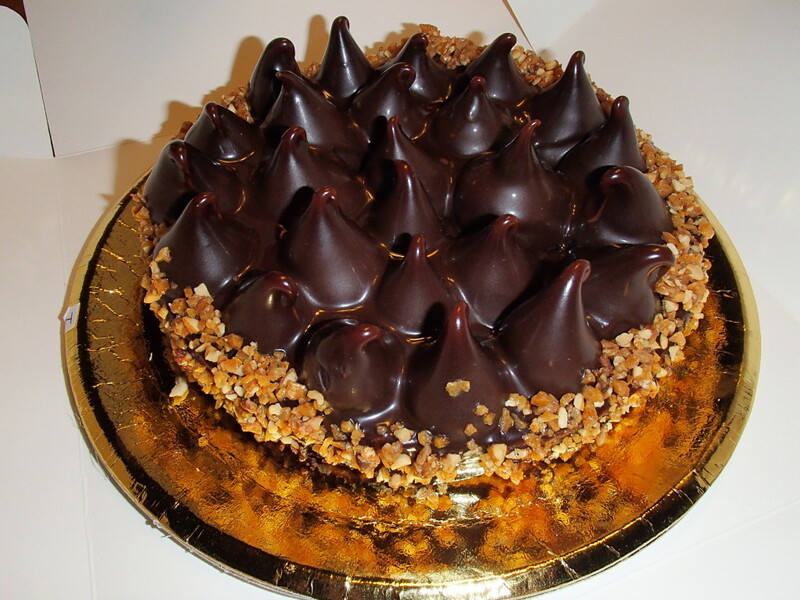 Argentinians appear to have a major sweet tooth, as there was an abundance of bakeries throughout the city. On the second day, we popped into the bakery across the street where Michael was instantly attracted to a decadent- looking cake. We had no idea what it was, but he just had to have it. It turned out to be a giant shortbread cookie with a layer of rich carmel-like goo, topped with chocolate drops shaped like gigantic Hershey kisses. We later learned that the goo was dulce de leche – which we think is the stuff that the Argentinian soul is made of. TV commercials showed a happy family putting it on everything from sandwiches to bananas. The markets had ample shelf space filled with tubs in different sizes. And, when you want something quick on the go, you can grab a cookie filled with the stuff – called alfajor. Alfajores come in different flavors and there’s even a low calorie version made with rice cakes (which was very tasty). In case you are wondering, the dulce de leche cake tasted as good as it looked. We gobbled it up in a few days and then went on a diet – mostly due to the abundance of tapas we consumed during the summer in Spain. Mate tea… Mate is an herbal tea with a strong grassy, earthy, bitter flavor. It is made with the stem and leaves of the yerba mate plant in a gourd and drank with a bombilla that filters out the stem and leaves. Michael has become a big mate fan; Lori, not so much. Wine… Argentina is a big wine producing country, with Malbec being the top varietal. We haven’t tried much Malbec, so we did our own little tasting at home thanks to the variety of half bottles available at the local market. The wine was fruity, smooth, and yummy. We typically post reviews on Tripadvisor, but this flat is not listed on the website. The flat was very spacious and comfortable. We liked the modern décor, big bedroom, stereo, and view from the living room. The building had a small, but adequate gym. We are bummed that the cold weather didn’t give us the chance to try the rooftop pool. The rate included cleaning twice a week. 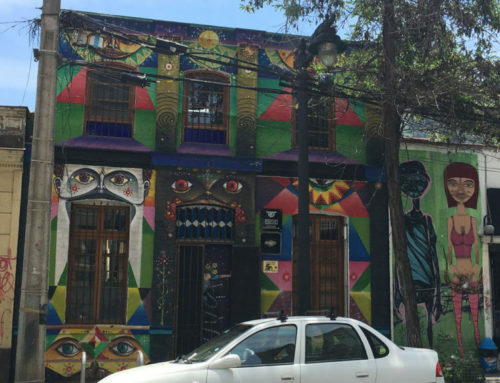 The location was fairly convenient – lots of restaurants and markets nearby, five blocks to the metro, and a fifteen minute walk to Palermo Soho. There were a few negatives…There was no toilet paper when we checked in and we had to run to the store at 9:30 PM to buy some. The wi fi was not secure. The flat was very dusty – we think it was due to the feather comforter (which had a hole) and rugs. The pillows were hard. The washing machine was not in the flat – there was a laundry room with coin operated machines in the basement (the website did not fully describe this). The staff arrived 30 minutes late for our check out! We would have just left, but we had to get our cash deposit back. And finally… The property management company required payment in cash at check in (something we have encountered in the past). Since we made the reservation after leaving the US and couldn’t obtain enough dollars or euros while traveling, the company agreed to accept payment by Paypal if we paid their merchant fee (but we had to pay the hefty security deposit in cash). Unfortunately, they padded the fee and over charged us (Lori has a PayPal merchant account and is familiar with the fees). As we had already paid the deposit, we did not feel it was worth the hassle and risk to argue the extra charge, but we would think twice about staying at a flat managed by this property manager.